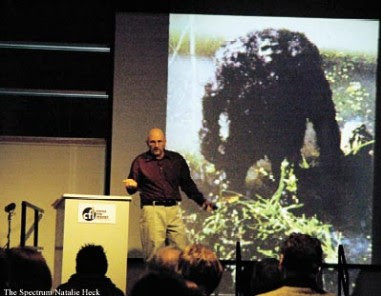 Bigfoot News | Bigfoot Lunch Club: Skeptic gives Top 10 why Bigfoot does not exist. 1) Fossilization is longer-shot than winning the lottery - ten times. Paleos talk about all the dinosaurs we have yet to find. It's estimated that we have evidence for 5% of the primates that have ever lived...oh, but wait. Several possible sasquatch progenitors are right there in the fossil record. We didn't have evidence of chimp and gorilla ancestors until the 21st century. The red panda's first fossil progenitor is also 21st-century...from Tennessee. Fossil records say nothing about what exists now anyway. 2) A couple of bodies have been examined...by the hunters who shot them. (So much for another assumption.) One hunter described a foot on his victim that Krantz had already speculatively diagrammed as necessary for a biped of that size and weight. Could they be tall tales? Maybe. But there's no less reason to trust than to toss them. 3) If no one believes sighters or follows up evidence, there could be tens of millions and the world wouldn't know. 4) Eyewitness reports display frequency and coherence - the only two required basics for scientifically testable evidence. 5) "Most" photos are ambiguous? Oh, so the good ones don't count? Hunh? 6) That is called "proof." There is none of that, for any species, until science confirms it. 7) Not that they've told us. They have their reps as bird researchers to think about. Why would they want to deal with Radfords? One wonders how many they saw of the mammals known to be there. One can bet, for almost all of them in almost all instances: none. 8) And the saola, a 300-pound ox we discovered after fifty years or so of continuous war denuded, um, parts of its habitat. And the kouprey, only about three or four times that size. I could keep going, for, say, an hour, but you get the idea. 9) Which means, no proof. Some people don't get how science works. I don't think you know how science works. Science does not validate the existence of a creature for which there is zero physical evidence. Dian Fossey set out to find the mountain gorilla. She did so. You guys have been searching for this bigfoot for what, 50 years or longer? Not even a good photograph that we can all agree on? Why do you tout all the other new species that we have discovered as some validation of bigfoot? They are not. You could keep going for an hour talking about other species that have been confirmed, but at the end of that hour you still have not shown us a single shred of credible evidence for bigfoot. Those are not your victories. You have no victory. You don't have much of anything worth celebrating. Your point #9 is most confusing of all, but I've come to recognize if there is one thing bigfootists have in common, it is the perplexing assertion that bigfoot exists because there is no evidence for bigfoot. Bones of a 2 mil year old half human half ape were found today. wasnt the silverback gorilla discovered/documented scientifically for the 1st time in the 1950's? When biologists and anthropologists set out to find a living species, they tend to find them. Bigfoot has not been found. Very likely because it does not, and probably never did exist. Please name the biologists and anthropologists which set out to find bigfoot, and where they published the results. Please tell me your opinion on the tracks collected. I went to college, and am curious how graduating makes me more adept at finding elusive creatures in the forests and swamps of North America? I must have been sick when thst class was offered! I would love to read about the thousands of eyewitnesses, including law enforcement and lifel9ng outdoorsmen who have encountered every living species in North America on a repeated basis, some of which hold degrees equal to the biologists and anthropologists you speak of who seemed to not be able to find it. Perhaps this study they "set out" to do doesn't exsist? To use some of your verbiage, it is "very likely" that you "probably" have not made any serious effort to find out about bigfoot, but comfort yourself on your higher education as it asuages your ego. I live in an area where Bigfoot sightings have been commonplace since the old trapper claimed he was abducted by a family of Bigfoot in 1926...no real reports prior to that...my neighbour knows this wilderness area like the back of his hand...he has guided hunters and fishers...he travelled this wilderness area for 50 years going everywhere where others never go...the only creatures he said he ever saw were the ones native to the area...bear, dear, elk, lynx etc...never a Bigfoot and never any unidentifiable tracks...nothing...his Native companions say the same...they also say Bigfoot is just a myth in their culture...it never has been real...a lot of time and effort and money is wasted chasing a fairy tale. can you picture such an animal?﻿ Claims of having seen it were widely ridiculed. That is, until Europeans discovered the kangaroo.So Time, effort and money is not being wasted chasing a fairy tale my friend. Good job Benjamin, at sweeping the dozens of eyewitness reports by law enforcement beneath the rug. Good job at ignoring footprint casts and dermal ridges, as they are a real thorn in our side. Good job at making Birders reports as being more important than all other reports put together. That little magical trick is known as "misdirection". Good job at ignoring the P-G film and the Freeman footage. We can't have those names floating around, when there are timber industry jobs at stake. If it wasn't for the fact that Bigfoot is paranormal, the timber industry would shoot all of the 10 million or so Bigfoot, just like they did to the spotted owl. Your check from the timber industry is in the mail, Ben. We just don't know what we would do without your help is squashing this threat to our industry. things dont need the permission of scientists to exist. ..